Do you feel that with your busy life, you have no time left for friendships? Friendships can have a major impact on your health and well-being. But, in today's day and age, we have such busy lives that it only becomes difficult to build or maintain friendships. Go easy. Don’t overwhelm friends with phone calls, texts, instant messages, or emails. Respect your friends’ boundaries. Adopt a healthy, realistic self-image. Work on building your self-esteem by taking care of yourself, eat a healthy diet and include physical activity in your daily routine. Vanity and constant self-criticism can be turnoffs to potential friends. Avoid relentless complaining. Non-stop complaining can put a strain on your friendships. Talk to your friends about how you can change the parts of your life that make you unhappy. Adopt a positive outlook. Try to find the humor in things. Laughter is infectious and appealing. Listen up. Ask what’s going on in your friends’ lives. Avoid talking about your own problems all the time. Try to only give advice when your friends ask for it. Don’t judge. Give your friends space to change, grow, and make mistakes. Encourage your friends to freely express their emotions. Respect privacy. Keep confidential any personal information that your friends share with you. Try not to ask questions that make your friends uncomfortable. There are some cold wars that have to be kept aside. May be time will heal them. 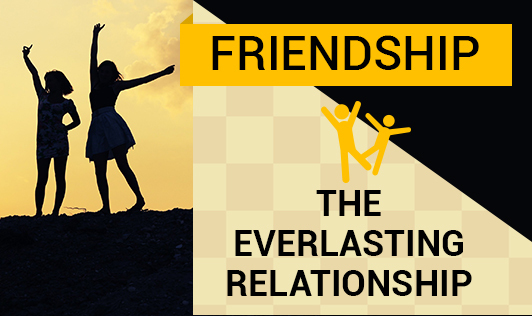 Enrich your life with a beautiful relationship called “friendship”. It will help you maintain overall balance in life.